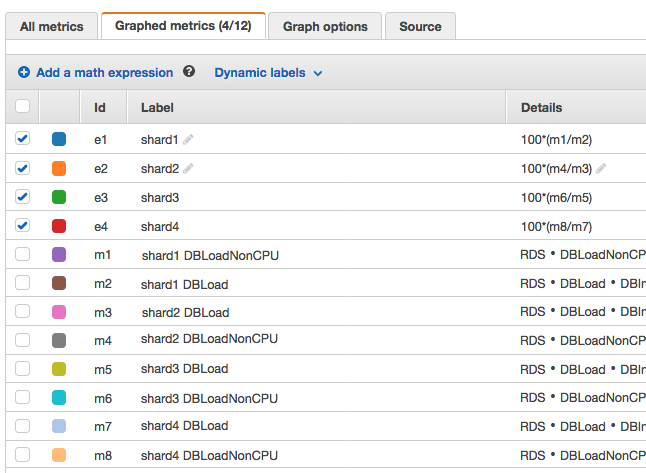 Amazon RDS Performance Insights (PI) doesn’t have a single pane of glass dashboard for clusters, yet. 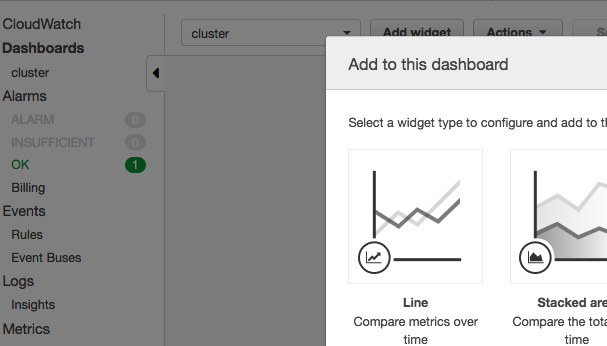 Currently PI has a dashboard that has to be looked at for each instance in a cluster. 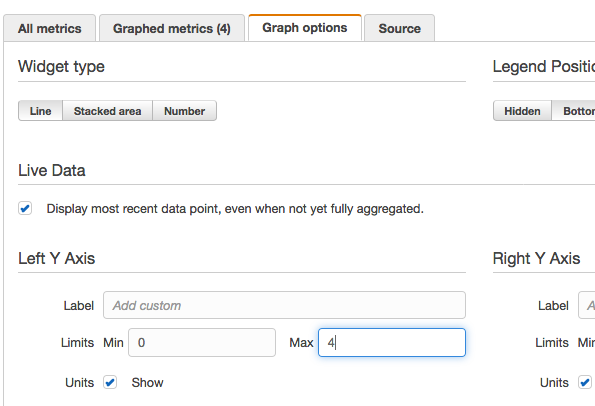 On the other hand one can create a simple cluster dashboard using Cloudwatch. 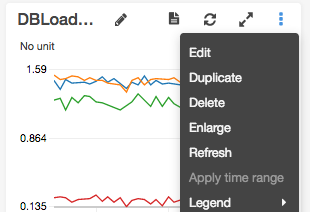 PI, when enabled, automatically sends three metrics to Cloudwatch every minute. These metrics are measured in units of Average Active Sessions (AAS). AAS is like the run queue on the UNIX top command except at the database level. AAS is the average number of SQL queries running concurrently in the database. 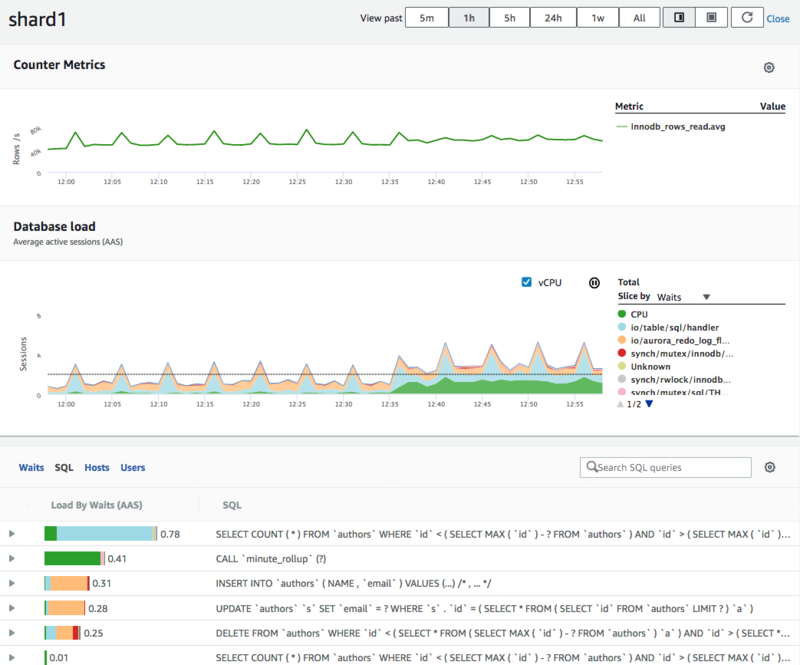 In the case of DB Load AAS, the average is over 1 minute since the metrics are reported each minute, and represents the total average # of SQL queries running concurrently. The DBLoad AAS can be broken down into those queries that are runnable on CPU, which is DBLoadCPU, and those queries that are not ready to run on the CPU because they are waiting for some resource like an I/O to complete, a lock , a latch, or some resource that can only be accessed in single threaded mode like a latch or buffer. These metrics can be used to look at the health of the database. For example we can only have as many SQL running on the CPU as there are vCPUs. If DBLoadCPU goes above the # of vCPUs then we know that some of those queries that are runnable on the CPU are actually waiting for the CPU. 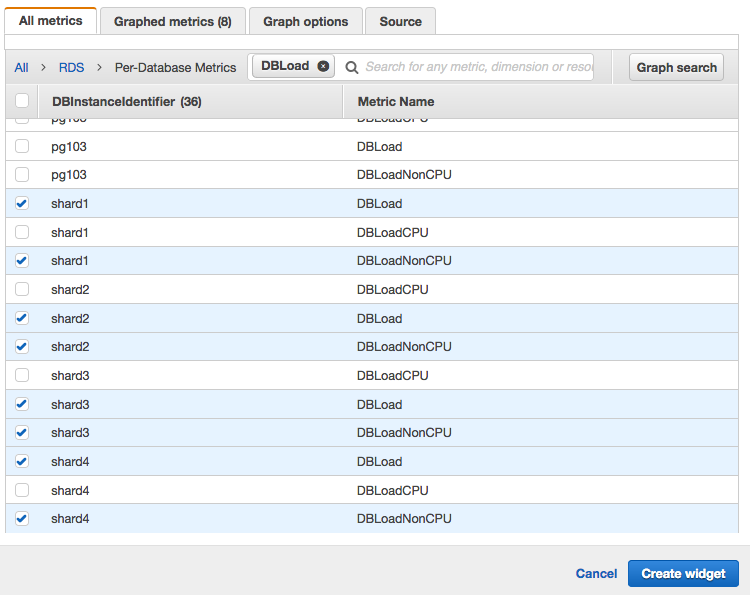 We also know that when DBLoadNonCPU is low or near 0 then the queries are not waiting for resources and can execute. When DBLoadNonCPU goes up significantly then that represents an opportunity to optimize. For example if queries are spending half their time waiting for IO then if we could buffer that IO we could remove the IO wait and theoretically the queries could go twice as fast, doubling throughput. By looking at DBLoadCPU for each instance in a cluster we can see if the load is well balanced and we can see if the load goes above the maximum CPU resources of the instance which would indicate a CPU bottleneck. By looking at the ratio or percentage of DBLoadNonCPU to total DBLoad we can see how much time is wasted waiting for resources instead of executing on CPU. By show this percentage for each instance in the cluster in one graph we can see if any particular instance is running into a bottleneck. If so we would want to look the performance insights dashboard for that instance to get more detail about what is happening. So let’s set up a cluster dashboard using PI data. 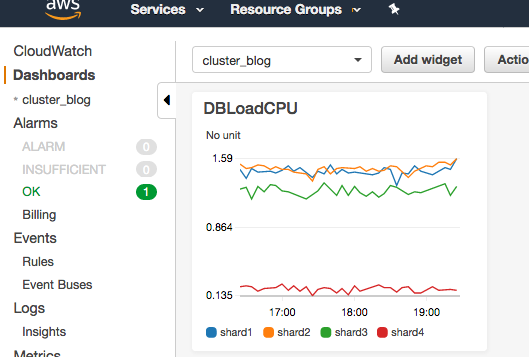 In the case of this blog I created an Aurora MySQL 5.6 cluster with the original writer node and 3 reader nodes. You can create the initial instance with one reader node, then after creation, go to modify instanced and add reader node. My nodes are shard1, shard2, shard3 and shard4. I got a surprise, as each shard instance was suppose to have same load but can see something is wrong on shard4. Will investigate that as we go. For now there are some options on the widget that I want changed. I want the graph to start at 0 (zero) and have a maximum of 4 , since my instances have 2vCPUs and I want to be able to look quickly at the graph to know where I’m at without having to read the axis everytime. My max available CPU load is 2 AAS since I have 2 vCPU. I set the max at 4 so there is some head room to be able to show load about 2. 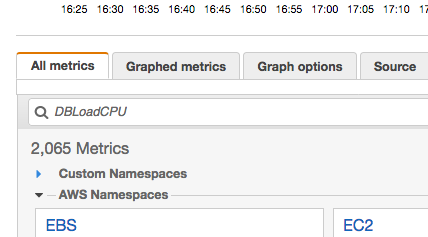 Click the third tab “Graph options” and enter 0 for min and for max enter a value above the # of vCPUs you have on your instance. I have 2 vCPUs, so I enter 4.
click update in the bottom right. I can see I’m running a pretty good load as shards 1-3 are running around 1.5 AAS on CPU i.e. our SQL are asking for about 75% of the CPU capacity of the box. ( 100% * (1.5 AAS CPU / 2 vCPU) ). I also see shard4 has a lower DBLoadCPU. Turns out I had turned off the load to that shard this morning and forgot, so I restarted it. Now lets add a widget to see how efficient our load is, i.e. what % of the load is waiting instead of being runnable on CPU. 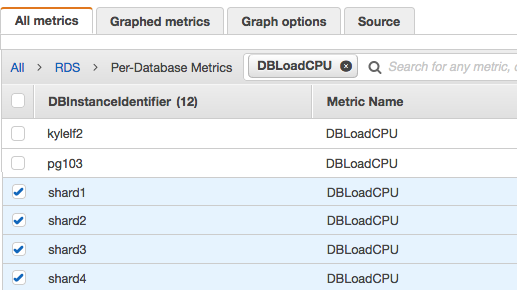 Create a new widget and search for DBLoad and choose the 2 metrics DBLoadNonCPU & DBLoad for all 4 instances. We will use them in a mathematical expression. You can see I restarted the load on shard4 because the DBLoadCPU has gone up. Be sure and click “Save dashboard” so you don’t loose you work. Now what do we see? 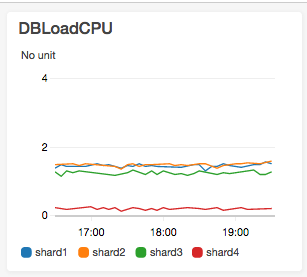 well now that I’ve restarted the load on shard4, we see on “DBLoadCPU”, the DBLoadCPU is pretty evenly balanced. On “% bottleneck” we see it’s pretty low except for shard1. To find out what is happening we have to navigate to the PI dashboard for shard1. Looks like shard1 is spending a lot of it’s load waiting on resources. Let’s go to the PI dashboard for shard1. we can see that on the left most of the load was not CPU. CPU is green. All other colors are waiting for resources. This is the write node and other activity is going on than the reader nodes which are only selects. On the right hand side we can see CPU load went up so the ratio of Wait load in relation to CPU load and total load went down. 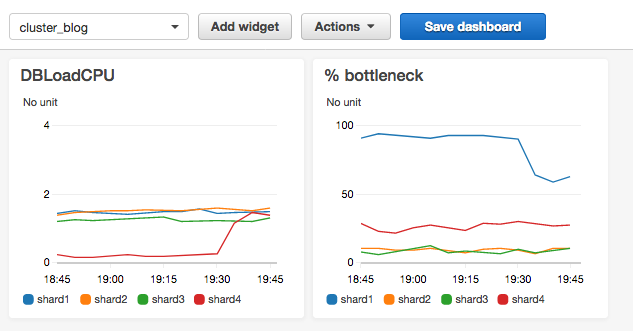 This is what we see in the “% bottleneck” widget we made in Cloudwatch. Now what are those resources that we are waiting on and what changed to make CPU go up? We can see that by exploring the PI dashboard. I’m feeling very determined on this one. Yes I have a lot of determination to inform blog readers about determinism, and yes I have run out of words that sound like DETERMINISTIC. But one of the most common misconceptions I see for PL/SQL functions is that developers treat them as if they were “extending” the existing database kernel. By this I mean that developers often assume that wherever an existing in-built function (for example TO_NUMBER or SUBSTR etc) could be used, then a PL/SQL function of their own creation will work in the exactly the same way. Often that will be the case, but the most common scenario I see tripping up people is using PL/SQL functions within SQL statements. Consider the following simple example, where a PL/SQL function is utilizing the in-built SYSTIMESTAMP and TO_CHAR functions. Let us compare the output from the function when used within a SQL statement, with the results from same built-in functions used directly from the SQL statement. A direct call to SYSTIMESTAMP is fixed for the duration of the execution of a SQL statement, but this is NOT the case for the SYSTIMESTAMP call made within the PL/SQL function. The PL/SQL function is being called multiple times during the single execution of the SQL statement, and hence each execution is totally entitled to return a “fresh” result from SYSTIMESTAMP. Moreover, the database makes no guarantees that a PL/SQL function will be called once per row encountered in a SQL statement, so if your PL/SQL function changes session state in some way (for example, a package variable) then you can never assume that there will be a 1-to-1 relationship between rows processed and PL/SQL function executions. The only way to be sure that you won’t get unexpected results from PL/SQL function calls within SQL is for those functions to be deterministic, and responsibility for that lies entirely with the developer not with the database. So please don’t think that the solution to this is just throwing in the DETERMINISTIC keyword. You need to inspect your code and ensure you won’t get spurious results from that PL/SQL function when used from SQL. Watch seasoned technical presenters go deep on PostgreSQL internals. Hear serious users present the latest about how they are using PostgreSQL and what they’ve learned. Connect businesses who are doing redundant work so they can collaborate instead of each repeating the other’s work. Last week I published a summary of the first two days of the conference which included the summits, tutorials and training sessions. I tried to keep a few notes during the final three days of the conference as well so I could share a bit about my experience this year. But before I dive into the day-by-day summary… first, a few short high-level points. Who attends PostgresConf? During my session about Wait Events I asked two questions to scratch the surface a little bit. First, it seemed clear that the vast majority of session attendees had been working with relational databases for more than a decade and a number for more than 25 years. Second, it seemed clear that the vast majority of session attendees had worked seriously with a relational database other than PostreSQL as part of their job. Of course I expected these things would be true for some attendees, but it surprised me just how many – it seemed to me like almost everyone in the room. What was great about PostgresConf? First and foremost, I give PostgresConf an “A-plus” … highest possible marks … on the two things I personally value the most from a user conference: technical content and user representation. I went to as many sessions as I could and I can personally vouch that there was quality material. And I met a bunch of top notch engineers from a wide variety of industries using PostgreSQL in serious ways. Running a special track for regulated industries using PostgreSQL. They support this class of users not only in the topic selection, but even in the room setup – for example rules that prohibit recording. Encouraging as many different people as possible to attend and participate. The conference code of conduct was taken seriously with a third party to independently receive, review and investigate any reports. There was an excellent general session and a panel discussion that started conversations – which may not have otherwise happened – around workplace dynamics and common assumptions we make. (If I could hazard summarizing one takeaway: I still do things at work which unintentionally assume that my co-workers are similar to me in subtle ways where they might actually differ!) Finally, on Friday afternoon, a time and space was provided for people to have conversations about career trajectories and the job market. With the rapidly growing demand I see for PostgreSQL skills, we’re going to need everyone who can help! So lets listen to (and become better advocates for) those in our industry who aren’t sure whether they can fully be part of it. Two large, established software vendors whose software ships with embedded PostgreSQL as a default data store (one of these software packages supports a number of customer-managed DB backends but many customers use the default embedded PostgreSQL database). Major University (over 150 years old) actively working to migrate critical backend business systems off commercial databases and onto open source. They have learned that you need to look at the stack as a whole; it proved infeasible to change the backend of applications that are tightly integrated with one specific database when both are sold by a single vendor. Changing the application itself is sometimes necessary. Two FinTech companies: a credit/lending support company and a brokerage both already relying on PostgreSQL in their business. Medium-sized non-profit (100ish people in IT), historically a commercial database shop, exploring open source databases and cloud-based architectures. Two individual DBAs that I didn’t catch their industry. One was following up from Monday’s Hands-On Lab and the other was asking about how to identify applications which might be good starting points for migrating to cloud-based PostgreSQL. We talked about migration success factors like application complexity and database procedural code. The opening general session. It was fun to hear the PostgresConf organizers talk a bit about how the conference is continuing to grow (mark your calendars: they already announced PostgresConf 2020 will be March 23rd through 27th!) and right after that to hear Marc Linster fill in the back-story with the changes and growth that happened over the last ten years. One thing I remember Marc saying was that the questions people ask have changed: five years ago people were trying to understand PostgreSQL and today they are increasingly asking questions about integrating with their larger environment. Dennis Tighe talked about PostgreSQL Security Best Practices from the perspective of Amazon RDS. I was very impressed with this talk for its breadth of security-related topics: external roles/principles/access, data encryption and key management, sharing data, network segmentation and wire encryption, database account/role management, password management, auditing… and all of these topics covered from the perspective of PostgreSQL. I told Dennis several times that talks like this should be available at more user conferences! Denish Patel gave a session on SQL performance tips titled: why isn’t my query using an index? Denish gave an overview of join types and optimizations, introduced the PostgreSQL Genetic Query Optimizer, and then dove into topics including cardinality, partial indexes, histograms and optimizer parameters. I especially enjoyed his samples drawn from the public flight arrival on-time statistics for 2018. DBAs from my own rather large employer! I mention this because it was a real treat to have DBAs from a few different teams around who could share their own stories and lessons learned as they have been running real production workloads on PostgreSQL and migrating new workloads from commercial databases onto PostgreSQL. I love running into these guys at conferences! Baron Schwartz said we were the very first people to find out that he is re-titling his talk: “Everything You Need To Know About PostgreSQL EXPLAIN.” This was a high-quality, accessible talk introducing the topic of execution plans and describing why they are important. After introducing them and peeling back the layers a bit, he then discussed what can go wrong and how to troubleshoot. Grant McAlister gave a session titled HOT – UNDERSTANDING THIS IMPORTANT UPDATE OPTIMIZATION. I did point out to Grant that it’s the only session at PostgresConf which is shouting in all capital letters; he wasn’t quite sure why that happened. But I’m not complaining, because if you like database internals as much as I do then this might have been the best presentation at the conference. I once told someone that I think Grant is a combination of Julian Dyke’s ability to make genius slide animations with Jonathan Lewis’ ability to construct simple tests demonstrating complex database behaviors. My session about Wait Events in PostgreSQL! Around lunch time I went to go hide somewhere and review the content. As I was reviewing, it became evident that I likely had too much content… and I ended up a bit stuck for the next few hours trying to work on that. Well… ask anyone who came to the session… I did not succeed in trimming up my content enough!! But the session seemed successful anyway based on the positive feedback from attendees. The conversations I most remember from Friday were around user group and community organizing. Conferences in South Africa and Spain, user groups in Chicago and Denver and Seattle, and a contact in Raleigh. In addition to the general sessions on Friday, I made sure to attend Jim Nasby’s talk titled: All The Dirt On Vacuum (PG 11 Edition). There’s a version of this talk from 2015 on YouTube but it’s always worth catching Nasby live if you can, because he’s constantly updating and improving the talk. The question that I most often ask about vacuum: “how much longer until this finishes?” The PostgreSQL docs list the Vacuum Phases but they don’t mention that some of these phases might get repeated multiple times. Nasby’s talk brings it all together so that you can understand the whole process and the configuration settings that impact it. Last but not least… last year I was one of the mentors helping high-school students all around the globe who made contributions to open source PostgreSQL through Google’s Code-In contest. One of the contributions these students made was to create some really cool sticker and pin designs that could be used to promote the open source project! PostgresConf sponsored ordering a bunch of real stickers and pins with the designs created by these high school students. And we had some fun with this on the exhibition floor: each booth got one or two designs, and attendees who wanted to get all the sticker/pin designs would have to hunt around. In case you’re wondering whether anyone got them all… on Friday, I discovered at least one person who did: Ryan Lambert of RustProof Labs! As you can see the rules fall into three groups: system, operation, and object – and you can’t help noticing at all three levels how commonly the theme is: “just stick with the defaults!”. As so often happens when I start writing a catch-up or “remind myself” not I found that Tim Hall has already written all about it.